Yay! Once again its time to search the blogosphere to find the ultimate recipe for our monthly Crazy Cooking Challenge. This month, Tina over at Moms Crazy Cooking, had us all on the search for fudge recipes. I will tell you, this has probably been my favorite recipe search so far. It seems the only time of year that I actually eat fudge is around Christmas time so it only seemed appropriate that Peppermint Fudge be my featured recipe. 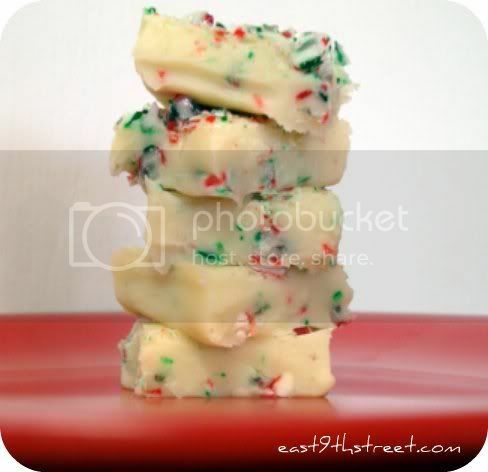 I specifically searched for Peppermint Fudge recipes and came across an awesome blog, Mele Cotte. Chris, the owner of Mele Cotte has several wonderful recipes on her site with gorgeous pictures that make you wish your computer screen was scratch and sniff! Line your 8×8 dish. If you haven’t tried the new foil/parchment paper you are definitely missing out! It makes lining a pan so much easier. In a double boiler or heatproof bowl set over simmering water, melt/combine the chips, condensed milk, heavy cream and baking soda. Stir frequently until smooth. Remove from the heat and add both extracts and 1/2 of your candy canes. 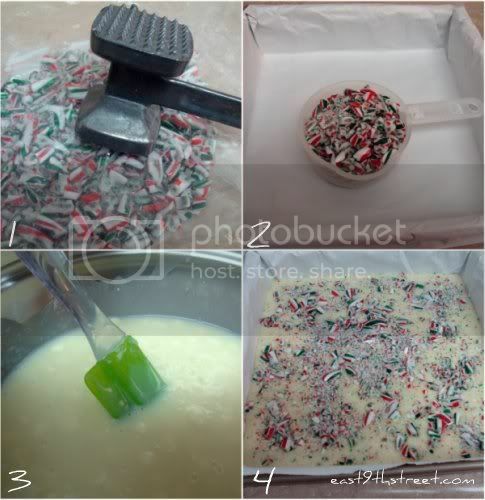 Pour into your pan and sprinkle the remaining candy cane pieces on the top of your fudge. Refrigerate for 3 hours, or until set. Remove from pan and cut into squares. Chris recommends using peppermint candy crunch which you can find at Amazon. I am taking her advice on this and have ordered some for my next batch! I hope you liked this recipe and if so, please show it some love by voting for me on the linky below! Have a happy holiday season full of sweet treats! What a lovely festive fudge! This is so cute and festive. Good job! I am sorry I am just seeing this now! Thanks for choosing my peppermint fudge for your challenge. And, I am thrilled you enjoyed it! It is a favorite of mine as well. I am eager to know what you thought about it with the peppermint crunch, as opposed to candy canes. No problem Chris! I’ve actually separated the red and green crunch (I know, I know….) and am using the green for St. Patrick’s Day so I’ll let you know!